CANADA 150 in the Lieutenant Governor’s own words. A year of celebration, recalling the milestones on the journey to becoming the country we are today. A year of reflection and dialogue about our collective aspirations for the future. This space documents monthly a sample of events that brought us together. Throughout the holiday season and this last month of the year 2017, so many events were infused with reflections on the questions of who we are and who we wish to be. Numerous events recognized the volunteer efforts of individuals, such as: a reception at Carleton University in Ottawa on December 2 to present Ontario 150 awards, a reception in Toronto on December 14 celebrating the efforts of the Ontario Public Service employees and their contributions to the United Way, a private ceremony honouring Jay Switzer with investiture into the Order of Canada on December 11. On December 13 in Toronto, the VR Empathy Series, hosted by the House of VR, demonstrated the power of what is possible through emerging technologies. As a tool to develop empathy, Clouds over Sidra put us in the middle of a refugee camp allowing us to view the world from different perspectives. The 50th anniversary of the Accademia Italiana della Cucina on December 6 tapped into a rich vein of history and culture, the tradition of cooking and eating together, sharing a part of ourselves as we develop socially cohesive communities. On December 4 the 39th annual Conference of Government Ethics Laws was held in Toronto. Practitioners and academics addressed matters of good governance and social justice, the imperative of integrity, and the development of trust and confidence in our institutions, and evidence-based decision-making. While celebrating the strength of diversity and the promotion of inclusion, there was recognition that inequality persists and that in some places democracy is fragile. In Ottawa on December 11t the Rt. Hon. Beverley McLachlin, Chief Justice of Canada was recognized for her central role in Canada’s legal system following the creation of the Charter of Rights and Freedoms and the evolution of Indigenous law. On December 6 the Let’s Talk Science National Leadership Conference, Canada 2067, proposed a bold and ambitious agenda for the next 50 years. The dialogue illustrated how to navigate a path that would allow us to prosper from evolving science, technology, and innovation while being aware of the human dimension. A diverse group of individuals from many sectors, disciplines, and geographies concluded that part of the answer lies in education and life-long learning—making STEM education more accessible, engaging, and productive, while nurturing new voices and fresh perspectives with a goal of empowering critical thinking. Through a photo exhibit at the Ryerson Image Centre, The Faraway Nearby: Photographs of Canada from the New York Times Photo Archive, we were reminded of national experiences during the past century that included major political events and iconic landscapes and portraits of individuals as seen through the eyes of the “international newspaper of record”. In honour of Canada 150, Toronto entrepreneur Chris Bratty gifted an amazing collection of 25,000 photographs of Canada from the New York Times Archive. And so a New Year begins: one of hope, optimism, and resiliency built upon a foundation of values that will sustain us in a world of change, challenge, and uncertainty. As Canada’s 150th year of Confederation drew to a close, November brought events during which we looked to the past, celebrated the present, and thought about the future. Here are some examples. Re-enacting of Canada’s first Parliament: On November 6 the community of Stratford celebrated the first Canadian Parliament in session from November 6, 1867 to July 8, 1872. The drama students of Central Secondary School presented an authentic re-enactment of the first sitting and mingled with the audience while in character. In just a brief time we were reminded that issues that debated, such as the desirability of choosing a speaker competent in both official languages, and the nature of the political discourse, continue to be ever present. Canadian Defence at 150 and Beyond: On November 22 the NATO Association in Canada launched a commemorative book about Canada’s membership since NATO’s inception in 1949. The text confirms Canada’s commitment to democracy and presents perspectives in charting a productive way forward—a story of Canada (and Ontario) in the world. The Trans-Canada Trail reception: A reception was held on November 1 to recognize the significant efforts of volunteers, board members, champions, and trail builders in realizing an ambitious vision to build a trail that would allow us to appreciate the wonder and vastness of Canada. The stories left no doubt that we are a country defined by our environment and concerned about how we live with nature and steward the environment. And always we are reminded of the enduring history of First Nations, Inuit, and Métis peoples through learning about treaties and ancestral settlements. The initiative aims to continue to keep Ontario spaces green, safe, and accessible. Voices from Nunavut: This Canada 150 signature project had the objective of broadening Nunavut’s relationship with the rest of Canada and expanding our understanding of what it means to be Canadian in 2017. Curated by Gyu Oh of Iqualuit’s Nunatta Sunakkutaangit Museum, Voices from Nunavut offers visions of Canada in a series of videos created by youth in Nunavut’s 26 communities. At the TIFF Bell Lightbox on November 3, we were treated to the results. Using an iPad and recording tools, youth from each area created a video montage of their community, recording snapshots of what it is like to live there and of their pride in community. Royal Canadian Geographical Society’s 88th annual fellows dinner: In Ottawa on November 16 this annual dinner for fellows shone a spotlight on journeys and projects of 2017: the Canada C3 expedition, the Trans-Canada Trail, and the production of the Indigenous Peoples Atlas of Canada: all initiatives that focused on Canada’s natural cultural and social heritage, the spirit of exploration, and our geography. The Canadian Museum of History hosted the unveiling of a new piece of work from the landscape Arctic project of painter and filmmaker Cory Trepanier. Friends Indeed Canada: In honour of Canada’s 150th anniversary of Confederation, a concert of history and music was organized in Ajax on November 4. This Pakistani cultural society that promotes Canadian ideals of diversity, freedom, and democracy demonstrated cross-cultural social engagement through music and story. Oxford County 4-H celebration: 4-H was considered a signature organization for Canada 150. On November 10 Woodstock showcased its youth development program with awards for leadership and life skills development and its attempts to create social cohesion by supporting the Farm Credit Canada Drive Away Hunger program. The First and Next: What’s Been Done? What’s to be Done conference: The Institute for 21st Century Questions and L’idée fédérale convened on November 22 at the University of Toronto to discuss Canadian federalism. 9 Billion Lives: The topics of how to enable bold innovation for a sustainable future, how this can planet sustain a requisite level of population and more broadly, and how can we build resilience as we tackle the compelling and varied issues of our time were discussed by a wide-ranging group of thinkers and activists at the Lieutenant Governor’s Suite on November 24. 36th Ernest C. Manning Innovation Awards: On November 29 Toronto was the location of an event that paid attention to the imperative of innovation in pursuit of human change, improvement, and progress by celebrating the impressive efforts of Canadian innovators. From Truth to Reconciliation: Redefining Archaeology in Ontario: A symposium organized by the Ontario Archaeological Society in Brantford on November 17 was the first of its kind in bringing together academics and practitioners, and Indigenous and non-Indigenous people to consider the ethical practice of archaeology in responding to the relevant Calls to Action of the Truth and Reconciliation Commission. With the support of Canada 150 and Ontario 150, many commemorative events were realized this month: some focusing on historic milestones and others on visionary approaches for the future. Lieutenant Governor’s Visionaries Prize: The sixth and final public presentation in partnership with the Walrus Foundation occurred in Toronto on October 2 on the subject of science and technology. This was followed by an awards ceremony at the Lieutenant Governor’s Suite on October 3 to recognize the energy and enthusiasm of 36 finalists, the six winners, and the judges. Created by Think2Thing, Canada’s premier 3D printing atelier, the award itself highlighted the interplay between traditional artistic techniques and innovative technologies and processes. The Visionaries Prize project convened people in conversation across the province in recognition that citizen voices are the bedrock of a strong democracy. First Nations Peace Monument unveiling: On October 7, at the DeCew Historic Site in Thorold, an architectural sculpture designed by First Nations architect and activist Douglas Cardinal was unveiled. As part of reconciliation efforts during Canada’s 150 commemorative year, the Friends of Laura Secord Foundation, the city of Thorold, and First Nations leaders in the region commissioned this piece in the interests of developing a deeper understanding of the role First Nations played in the building of Canada, including warning the British forces of an impending American invasion during the War of 1812. October 7 was also the anniversary of the Royal Proclamation of 1763, issued by George III setting out the core elements between First Nations and the Crown. Dedication of Gi-Chi-Twaa Gimaa Kwe, Mississauga Anishinaabek AName Gamik: On October 27, the Chapel Royal at Massey College, designated by Her Majesty The Queen as the third Chapel Royal in Canada, was dedicated in a sunrise service as a commitment to the theme of reconciliation for Canada’s sesquicentennial. Chapels Royal are associated with the unique and enduring treaty relationship between the Crown and Indigenous peoples. This is the tangible outcome of a partnership between Massey College at the University of Toronto and the Missisaugas of the New Credit First Nation. EDIT: The inaugural edition of this 10-day immersive festival in Toronto, a partnership between the Design Exchange and the United Nations Development Programme, illustrated that design, innovation, and technology have the power to transform our lives for the better. Through curated exhibits, installations, and a speaker series, the aim was to establish an exchange for demonstrating, sharing, and participating in new ideas for facing global problems. Opening of the Canada 150 Lane at Clearwater Farm: This natural pathway, an eco-friendly driveway lined with maple trees, was inspired by His Royal Highness The Prince of Wales, and was opened on October 27 to honour Canada’s sesquicentennial. Clearwater Farm, the site of a longstanding working farm, is a project of the Ontario Water Centre in collaboration with the town of Georgina to demonstrate sustainable agricultural practices and protect the water of Lake Simcoe, generate economic activity, develop agri-entrepreneurs, serve as an educational opportunity, and is community hub. C150 Global Odyssey: In celebration of Canada’s 150, father-son team Bob and Steven Dengler undertook the world’s first Canadian around-the-world helicopter flight and the first ever father-son global circumnavigation. The all-Canadian crew, including Dugal MacDuff flew a Canadian-made Bell 429 Global Ranger helicopter over 38,000 km in one month starting on July 1 in Ottawa and visiting 14 countries. A reception on October 29 in Vaughan celebrated this sense of adventure and the generous donation of funds raised for the True Patriot Love Foundation and Southlake Regional Health Centre Foundation. Opening of DEEP Blue: A new art installation at the Ontario Science Centre was opened on October 12. This Canada 150 community art project, bringing the science of bathymetry and geo-data to illustrate the beauty, ecology, and majestic depths of Lake Ontario was created by Labspace Studio and 12 year-old Daniel Ranger under the initiative of GREATNESS: Great Art for the Great Lakes. World Premiere of ADIZOKAN: On October 7 the Toronto Symphony Orchestra partnered with Red Sky Performance to present a genre-defying creation that included Indigenous vocals, electroacoustic and orchestral music with dance and multimedia to explore Indigenous connections to ancestral origins. Glorious and Free? Canada in 2017: The International Festival of Authors held a benefit panel discussion in Toronto on October 20 in honour of PEN Canada to support PEN’s efforts to defend freedom of expression around the world. Unveiling of Canadian Pride: At the Ottawa Airport on October 3 an art piece by Ted Flowers, donated to raise funds for local food banks in honour of Canada 150, was unveiled. Funds raised as a result of this donation were directed to Purolator’s Tackle Hunger Program and Ottawa’s Food Bank and was the initiative of Alberta’s Lieutenant Governor brought the art work to Ottawa on the occasion of the arrival of the Grey Cup. Moments to Remember: The 50th anniversary celebration of Zonta Club of Niagara Falls was held on Persons Day on October 18, recognizing the service to community undertaken by professional and business women with the aim of empowering women to take their rightful place in society. Simcoe Street United Church celebrated a significant milestone on October 29th: their 200th anniversary. This month featured a significant number of multi-event projects, some created specifically to celebrate Canada 150 and others annual events that showcased the Canada 150 theme. Lieutenant Governor’s Visionaries Prize: This major project of the Lieutenant Governor’s Office invited people to submit creative and innovative ideas to address the unfinished business of building a sustainable future for all. In 6 Ontario locations, 36 finalists shared their ideas with the public. Presentations in Thunder Bay (September 13) spoke to the theme of reconciliation; in Kingston (September 190 about governance; in Windsor (September 21) on inclusive prosperity; in Waterloo (September 26) on environmental stewardship; and in Brampton (September 28) on social cohesion. Invictus Games: Established by Prince Harry in 2014, the Invictus Games are an international series of adaptive sports events for injured active-duty and veteran service members. Toronto Canada hosted the 2017 event from September 23 to 30, featuring more than 500 competitors from 17 countries. Thousands witnessed the power of sport in healing humanity as well as the unconquerable spirit of participants in sports as diverse as wheelchair tennis and basketball, swimming, athletics, cycling, and archery, and celebrated at concerts and opening and closing ceremonies. An accessibility innovation showcase educated and a breakfast with families of Team Canada simply inspired. 6 Degrees: The Institute for Canadian Citizenship, founded by the Rt. Hon. Adrienne Clarkson and John Ralston Saul, created and hosted 6 Degrees Citizen Space, a three-day global forum that engages a diversity of bright minds to explore topics of inclusion and citizenship in the 21st century. Opening on September 25 with the Baldwin-LaFontaine Lecture “Does Democracy Have a Future?”, delivered by Harvard University political philosopher Michael Sandel, the event concluded with the awarding of the Adrienne Clarkson Prize for Global Citizenship to artist, activist, and visionary Ai Weiwei. TIFF: September is the traditional month of presenting the best of international and Canadian cinema at the Toronto International Film Festival. It was an opportunity to see First They Killed my Father, a view of the Cambodian Khmer Rouge regime of the mid 70s as seen through the eyes if resilient children, and Long Time Running, an emotional and powerful reminder of the 2016 final tour of Gord Downie and the Tragically Hip by Canadian co-directors Jennifer Bachiwal and Nicholas de Pencier. The following are but a sample of events this month. Commemoration of the 225th Anniversary of the Opening of the first Parliament of Upper Canada: With appropriate pomp and ceremony, historical dress, music, and theatrical performance, Sir John Graves Simcoe, the first Lieutenant Governor of Upper Canada, was introduced to the people of Niagara-on-the-Lake on September 17. It was a moment to reflect on the thousands of people who have served in our representative institutions since 1792, exercising their duty to “improve the favourable situation” of this province and its people. Canadian Craft Biennial: On September 15, the Art Gallery of Burlington hosted this inaugural symposium and exhibition of Canadian craftspeople, including age-old traditions and thought-provoking innovations. We Global Learning Centre: On September 27, in the presence of Ban Ki- moon, the eighth Secretary-General of the United Nations, the new WE International headquarters was opened. This innovation hub with cutting-edge leadership training, digital classrooms, and expert resources is designed to inspire and support the WE Schools educational program, which each year engages 3.4 million young people, including marginalized and diverse communities around the world. RCAF Presentation of Colours: On September 1 the Royal Canadian Air Force received new Queen’s Colours (consecrated ceremonial flags) from His Excellency the Right Honourable David Johnston, Governor General and Commander-in-Chief of Canada, at Nathan Phillips Square in Toronto. This historic event, including a Colours Parade, recognized the proud tradition of service and dedication. Women’s Royal Canadian Naval Service 75th anniversary: This significant milestone, marked by a luncheon on September 9 in Toronto, reflected on stories of service to country, bravery, adventure, and camaraderie that provide inspiration to young women and girls. Bishop Strachan School: Canada’s oldest independent day and boarding school was founded in the belief that women were equals at a time when the concept was radical. The 150th anniversary of BSS was celebrated on September 12 in Toronto with a dedication ceremony of a new building in the presence of hundreds of empowered women and girls. Queen Victoria Public School: This public elementary and middle school constructed in 1921 serves as a community hub in central Windsor, welcoming Syrian refugee families. A memorial was erected to former student Farley Mowat as a tribute to his environmental work and to encourage student literacy. Fleming College 50th Anniversary: On September 22 the greater Peterborough community, in the presence of relatives of Sir Sandford Fleming and past and current educational leaders, reflected on 50 years of community building through responsive post-secondary education. Glenn Gould Tribute: A Canada 150 signature project, the Toronto Symphony Orchestra’s Canada Mosaic paid tribute to one of Canada’s greatest artists, Glenn Gould, on September 22 featuring pianist Jan Lisiecki and actor Colm Feore. The World Remembers Project: This initiative, created by actor RH Thomson, commemorates the centennial of WW1 by displaying on the exterior walls of Old City Hall in Toronto the names of deceased soldiers from all participating combatant nations each year for five years. On consecutive nights from September 24: November 11 the names of soldiers killed in 1917 were displayed. Power of Ideas tour: This Canada 150 signature event opened at the Ontario Science Centre on August 18. Through the collaborative umbrella of Innovation 150, particularly with support from the Perimeter Institute, ACTUA, and the Ontario Science Centre, an engaging and interactive exhibition was developed to encourage curiosity about science. This ambitious project is available to many communities across the country, tackling concepts such as the nature of the cosmos and quantum mechanics with imagination and fun. Our shared future depends on creative and critical thinkers. SESQUI: SESQUI is a revolutionary 360-degree cinematic experience: a visual spectacle called Horizon that celebrates the people and landscape of Canada. Opening in Richmond Hill on August 3, the big red dome incorporated virtual reality storytelling, interactive games, and learning resources. This signature event is a triumph of artistic talent, technical skill, and creative drive that presents a new and inspiring way to see and understand Canada. Order of Canada 50th anniversary: For half a century, outstanding Canadians have been recognized through the Order of Canada. On August 26 the Governor General hosted members of this society of merit, all together for the first time, during a gathering at Rideau Hall. In the presence of former Governors General and the Governor General-designate, members of the order provided inspirational thoughts (and entertainment) about Canada’s past, present, and future. It was an afternoon to be long remembered. Trans Canada Trail: Over 25 years generous, volunteers have persisted with an extraordinary vision of connecting Canadians from coast to coast to coast. On August 26 they declared victory in Ottawa. The Trans Canada Trail, on land and water, is 24,000 kilometers long: 5,200 kilometers in Ontario alone—connecting us to our history and geography, contributing to reconciliation, and encouraging our physical and mental well-being. Warm congratulations! Atlantic Charter: On August 14 the signing of the Atlantic Charter in 1941 off the coast of Newfoundland was commemorated by the unveiling of a plaque on the grounds of Toronto City Hall. The charter, signed by British Prime Minister Winston Churchill and American President Franklin D. Roosevelt, affirmed the principles of human rights, prosperity, and diplomacy, and was underpinned by a commitment to multilateralism. That blueprint for co-operation continues today as a guide for freedom from fear and want, the improvement of labour, economic, and social standards, and the achievement of safety and peace for all. Shaw Festival: In this celebratory year, Shaw chose to revive 1837: The Farmers’ Revolt. In Niagara-on-the-Lake on August 2, the audience looked back on events that have shaped our country while celebrating diversity of identities and voices. Democracy in the time of the 1837 Rebellion in Upper Canada was a concept both alluring and scary that helped sow the seeds that would grow into the idea of Canada. Soulpepper Theatre: On August 10 Soulpepper Theatre showcased the VideoCabaret production of Confederation Part II: SCANDAL & REBELLION. Set in the period of 1871 to 1885, the play exposes us to the tragedy and comedy of business barons and the building of a railway, the lives of parliamentarians MacDonald and Laurier, and the land claims rebellion of Riel and Dumont. Perfectly conceived for Canada 150! Stratford Festival: On August 18 the Stratford Festival presented an amazing theatrical piece in collaboration with the artists of Qaggiavuut. The Breathing Hole tells the story of the dream of an Inuit widow and a polar bear cub, the bear’s encounters 500 years later with the Sir John Franklin explorers, and a 21st-century cruise ship of scientists and entrepreneurs. With great care for authenticity and “Indigenous cultural truth”, and with stellar technical skill and human interpretation, Stratford allows the audience to learn about an Inuit point of view in today’s world, through storytelling. Canada Day on Parliament Hill: Finally, the day everyone was waiting for: Canada Day! 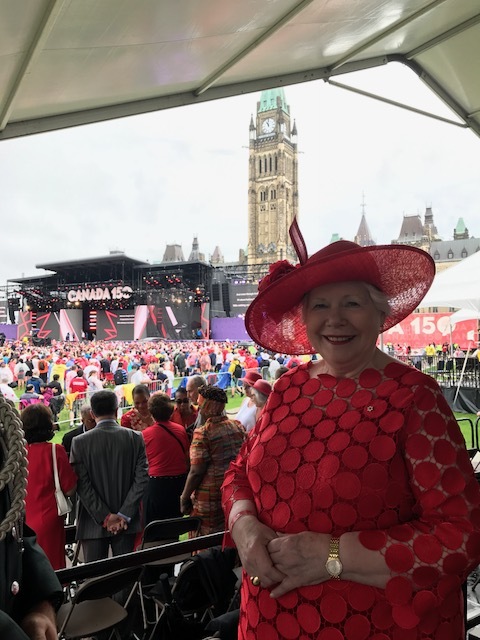 In the presence of Their Excellencies, Their Royal Highnesses, and the Prime Minister, thousands gathered on Parliament Hill to acknowledge the country we have become. Even the pouring rain could not dampen our spirits, and the best of Canadian entertainment continued throughout the day. Additionally, His Royal Highness participated in the re-opening of the spectacular National Arts Centre. Then others gathered at Rideau Hall to inaugurate the residence’s new doors as The Queen’s Entrance in celebration of Her Majesty’s Sapphire Jubilee, and to bid farewell to Their Royal Highnesses. It was a very full Royal Tour. rare Community BioBlitz: BioBlitz Canada 150 was an opportunity to celebrate Canada 150 by becoming a “citizen scientist” and working with experts to conduct a national inventory of Canadian species. On July 15 children and adults came together at the rare ECO Centre in Cambridge to immerse themselves in the wonder of nature. Edges of Canada: On July 20 the Stratford Summer Music Festival hosted a preview of an ambitious national concert tour of the National Youth Orchestra. For more than 50 years they have been part of our cultural history. Performing with the National Youth Choir for the first time, they demonstrated that music brings us and binds us together. Piece by Peace: A partnership between The Cotton Factory and the Hamilton Halton Brant Regional Tourism Association brought the Quilt of Belonging exhibit to Hamilton on July 28. This 120-foot long tapestry is made up of 263 quilt blocks created by either a First Nations person or an immigrant to Canada. It tells stories of belonging and was designed to communicate “that there is a place for every person in our world”. Trillium Park: I was treated to a tour of the new Trillium Park and the William G. Davis Trail at Ontario Place on July 5. To honour Ontario’s 150th anniversary, seven and a half acres of parking lot were converted to green space inspired by the histories and cultures of Indigenous peoples. It incorporates native plants, boulders, and rocks symbolizing the prehistoric Lake Iroquois shoreline, and includes a place to walk. The spectacular view provides a place for meditation and features an open-air pavilion for social events. Passion Over Reason: What could evoke the Ontario landscape more than the paintings of Tom Thomson? In this celebration of Canada’s 150th anniversary of Confederation, the McMichael Canadian Art Collection presented Passion Over Reason, a virtual conversation between Tom Thomson and feminist Joyce Wieland. A summer barbeque on July 8 opened the doors to all. North American Indigenous Games: Toronto was proud to host the 10th North American Indigenous Games, held in Eastern Canada for the first time in over 25 years during the week of July 16. Thousands of participants from all provinces and territories and 13 regions of the United States showcased their athletic abilities through 14 sports. Simultaneously, youth aged 13-19 celebrated heritage through cultural events in venues located across the Greater Toronto and Hamilton Area and the Six Nations of the Grand River territory. Drawing inspiration from the Calls to Action of the Truth and Reconciliation Commission, the Games created the concept of Team 88 to focus on long-term Indigenous athletic development and growth. Mississauga South Asian Community BBQ: On July 15 Mississauga resident Haroon Khan brought together hundreds of members of the local South Asian community in celebration of Canada Day and the 150th anniversary of Confederation. The event recognized with pride the contributions made by the community in helping to shape the destiny of Ontario and Canada. Elora Festival: The Elora Singers and the Toronto Mendelssohn Choir joined forces on July 14 to present an opening night concert: Night of the Proms. Celebrating its 38th year, the festival showcases how community dreams can be realized, welcoming the world to its doorstep, inspiring excellence in musical performance, and using music to build social cohesion. Toronto Summer Music Festival: On July 13 the opening night festival performance at Koerner Hall celebrated Canada’s sesquicentennial with the impressive St Lawrence String Quartet. It was a salute to great Canadian music and talent. HERE: Locating Contemporary Canadian Artists: This Canada 150 exhibition opened on July 20 at the Aga Khan Museum. Designed to cause us to think differently about identity, video, textile, painting, and sculpture illustrations conveyed the diversity of more than 20 artists. As we drew closer to July 1, the number of celebratory events increased. The following is but a sample. Royal Tour: Their Royal Highnesses The Prince of Wales and The Duchess of Cornwall spent the second day of their Canadian tour on June 30 in Eastern Ontario. They were welcomed to Canadian Forces Base Trenton, where they viewed search and rescue demonstrations, met veterans and business representatives of The Prince’s Charities Canada’s Prince’s Operation Entrepreneur program, and laid a wreath at the Afghanistan Repatriation Memorial. Subsequently they visited Wellington Farmers Market and the Norman Hardie Winery in Prince Edward County. A Place To Stand: On June 28, I hosted a gala to celebrate 150 years of Ontario and Canada and the 30th anniversary of Order of Ontario investitures. The evening at Roy Thomson Hall in Toronto was supported by the Government of Ontario through the Ministry of Citizenship and Immigration and its Ontario 150 Secretariat. Through spoken word, visual images, and music, under the direction of Hugh Brewster and Noel Edison, we reflected on the journey and the people that inspire this place we call home. Canada C3: This ambitious signature project, conceived by Students on Ice, is a 150-day icebreaker sailing voyage from coast to coast to coast. It aims to provide a transformative experience for a cross-section of Canadian society—scientists, artists, Indigenous Elders, immigrants, historians, youth, community leaders, and journalists—as they conduct scientific research, create music and art, and develop a deeper understanding of our geography and culture. Through modern communications technology, those of us on land can follow this journey of reconciliation and discovery. With pride, I wished them God Speed as they set sail from Toronto Harbour on June 1. Canada Learning Code Week: This initiative had a vision of inspiring and empowering youth through coding education to become creative and innovative digital citizens. On June 6 I joined enthusiastic students from Zion Heights Middle School at the House of VR in Toronto to learn the basics of coding in virtual reality. Legacies 150: On the occasion of Canadian Multiculturalism Day, Legacies 150, a Canada 150 initiative, was launched at Harbourfront Centre in Toronto on June 27. This exhibition of interactive photo essays, produced by the National Film Board of Canada, is composed of the personal reflections of Canadians from all walks of life about the legacies they inherited and the aspirations they leave for future generations. Changing the Game: Changing the Conversation: On June 10, I hosted a reception in honour of this Ontario 150 initiative of the Coaches Association of Ontario. It is a real investment in the future of women in sport, aiming to recruit and support 250 women coaches through mentors and accelerators. Family Ties: Ontario Turns 150: The Archives of Ontario developed this exhibition exploring the era of Confederation through the stories of four family groups in Ontario, showing multiple perspectives on life in the province during the late 19th century. The exhibition also includes a look at how Ontario celebrated the centennial anniversary of Confederation in 1967. Ontario Heritage Fair: On June 10 York University hosted a special edition of this fair to honour Canada 150. The fair aims to increase public awareness and interest in Canadian history through workshops and presentations showcasing student projects. Perth: The highlight of an official visit to Perth on June 5 was the Canada 150 celebrations at Queen Elizabeth Public School. Through performances and exhibits, the elementary school students displayed their knowledge of history, heritage, and culture. Thanks to the Upper Canada District School Board and the teachers at Queen Elizabeth for seizing this teachable moment and encouraging the development of responsible citizenship! A related visit to the oldest continuously operated canal system in North America, the Rideau Canal Headquarters and Visitors Centre, illustrated the extensive Canada 150 programming of Parks Canada. St. Catharines: The Lifelong Learning Niagara organization offers a lecture series for seniors in the 12 municipalities comprising the Niagara Region. On the occasion of the 150th anniversary of Confederation I was invited to address the group on June 7 about what it means to be Canadian. East Gwillimbury: A heritage celebration in honour of the re-opening of the Doan House at the open-air museum site of the Sharon Temple was held on June 8. The temple, an architectural gem constructed between 1825 and 1832 by a Quaker sect, has been designated as a National Historic Site of Canada. Owen Sound: During an official visit to Owen Sound on June 9, I learned about a significant number of anniversary celebrations during 2017. Several of these related to home-town war hero Billy Bishop: an exhibit at the Billy Bishop Museum in honour of the 100th anniversary of his receipt of the Victoria Cross, and the unveiling of a street sign Billy Bishop VC Way, the unveiling of a plaque to commemorate the planting of a Vimy Oak on the museum grounds. Ottawa – Canadian Museum of History: On June 30 I attended the official opening of the Canadian History Hall, a Canada 150 Legacy Project. On the day before, I enjoyed the presentation of the Governor General’s Performing Arts Awards at the National Arts Centre. Toronto: On June 16 the York Club celebrated the sesquicentennial of Confederation and the 50th anniversary of the Order of Canada with a dinner and a new plaque in honour of the club’s Order of Canada members. Viceregal conference: On the occasion of the yearly Conference of the Governor General, Lieutenant Governors, and Territorial Commissioners, which took place in Ottawa from June 18 to 20, several events highlighted the contributions of Indigenous peoples: the presentation of Canadian honours in recognition of outstanding Indigenous leadership, recognition of the national honorees of the Imagine a Canada art and essay competition, and a roundtable discussion with 4Rs Youth and Foundations Partnering for Reconciliation. Bearing: On June 22 in Toronto, Luminato presented a world premiere dance-opera inspired by the legacy of Canada’s residential school system. Through dance, music, and spoken word, the performance proposes that the “trauma of the past is inextricably linked to the present” and urges us forward collectively on the journey to reconciliation and recovery. Connected North and TakingITGlobal: Connected North delivers immersive and interactive education services to students in the North, many of whom are indigenous, through Cisco’s TelePresence video technology. On June 16, I joined Taking ITGlobal, the program delivery manager, to participate in a virtual school visit with Fort Frances High School as part of their Signature 150 initiative. Walrus Talks National Tour: On May 31 this signature project made its final stop in Toronto. Under the banner “We Desire a Better Country”, diverse voices from all walks of life shared stories with their fellow Canadians. In Toronto, artists and activists, and educators and scholars made us laugh and cry, and caused us to think as we celebrate with pride and love the country we can become. La Dictée Paul Gérin-Lajoie and the Ligue Nationale d’Improvisation on tour: This signature project was hosted by the Alliance Française Toronto on May 23. Full of good humour, teams of actors and comedians competed in improv matches and workshops en français for high school students. 150+ Reasons We Love Canada: VIBE Arts, a Canadian charitable arts organization, orchestrated a project that brought 60 murals that let us see the Canadian story through the eyes of youth. Their insights about geographic and social roots were brought to life with the help of community organizations throughout Canada. The Scarborough Town Centre partnered in making this signature project available for hundreds to see on May 26. Canada’s Greatest Storytellers 1867-2017: I hosted a new stage performance by author and publisher Douglas Gibson on May 23. Reading excerpts from each decade of novels and short stories and accompanied by Canadian music and caricatures by Anthony Jenkins, he introduced us to the works of French and English authors as well as a little-known Haida storyteller to illustrate the ways in which literature has shaped us shaped us as Canadian society. We left with an impressive reading list. Louis Riel: The Canadian Opera Company commemorated Canada 150 on May 5 by reviving a work originally commissioned for the 1967 recognition of 100 years of Confederation. Inspired by the Truth and Reconciliation Commission, the company engaged the Indigenous theatre community in the process of paying respect and bringing contemporary perspectives to the work of composer Harry Somers and librettist Mavor Moore. This interpretation included Indigenous performers and incorporated Michif, the Métis language. What Makes this Country Tick: In late May, the Peel Art Gallery Museum and Archives presented a retrospective exhibition of artist Charles Pachter. In honour of Canada 150, this well-known Canadian artist has donated a collection of his iconic work: symbols, images, and icons of Canadian identity. The Next 150, On Indigenous Lands: Ryerson University hosted the Congress of the Humanities and Social Sciences. During this gathering of thousands of scholars, researchers and policy-makers contributed their research findings and forged new conversations that examined the colonial past as prelude to bringing about positive change and reconciliation. ROM Ball: This year’s ball on May 6 paid homage to Canada 150 by showcasing the work of Canadian artists as diverse as musician and photographer Bryan Adams, fine art photographer Ed Burtynsky, visual artists Barry Ace and Charles Pacter, and singer and musician Rufus Wainwright. Prime Mentors 30th anniversary: An awards ceremony and reception were held on May 25 in support of an organization that has the objective of developing the potential of vulnerable youth through fostering mentorships and partnerships and building community. Experience Canada student exchange program: Designated a Canada 150 signature project, middle school students of the Winona Drive Public School hosted their counterparts from Québec in Toronto on May 29. This student exchange program aims to increase knowledge and experience about Canadian history, culture, and geography. Anne Frank – A history for Today: On May 31 I visited John Polanyi Collegiate Institute to view an exhibit assembled to commemorate Jewish History Month. In addition award-winning educators demonstrated a curriculum designed for the future including the SMaR program (science, math, and robotics) and the Integrative Learning (I-Think) Leadership Program. Canadian Youth STEM Conference: On May 25 Glenforest STEM hosted youth from locations throughout the province in looking to skills needed during the next 150 years. The program of inspirational speakers, mentoring, and hands-on activities was designed to encourage and expose students to educational and career pathways in the STEM fields. I was pleased to recognize the Hon. Bill Graham on his receipt of the United Nations Association in Canada Global Citizen of the Year Award on May 11 in Toronto. I hosted a luncheon on May 29 for members of the Harvard Women’s Leadership program as they gathered insights about Ontario and Canada. On May 2 I attended a performance of Assemblée Internationale 2017. Canada’s National Ballet School hosted 21 schools from across the globe and showcased Canadian choreographers. The Great War: The 100th anniversary of the Battle of Vimy Ridge was commemorated by events in France and Ontario, including, on April 9, a military parade and service of remembrance with The Queen’s York Rangers at Fort York, in Toronto, and a service and parade in Brampton recognizing the sacrifice of five Brampton soldiers. On April 7, the community of Peterborough and the Hastings and Prince Edward Regiment honoured those who fought in the Battle for Hill 70. The Battle of the Atlantic: To remember the 75th anniversary of the Battle of the Atlantic, the role of the Royal Canadian Navy, and the HMCS Prevost, a memorial dedication ceremony was held in London, Ontario, on April 29. Women’s Suffrage: On April 12, we marked 100 years of the right to vote for many women in Ontario. I welcomed young women attending Mr. Speaker’s “A Remarkable Assembly” event and students from Our Lady of Lourdes Public School in Waterloo. On April 28, the 20th anniversary dinner of Women in Law Enforcement celebrated the remarkable achievements of women who have served. The Gender Equality Forum, organized by the UN Global Compact, on April 3, focused on the role of the private sector and civil society in tackling gender equality. Unfinished Business: In recognition of the need to rewrite the narrative of the empowerment of women and girls, I announced an initiative called “Unfinished Business”. On April 13, “Trailblazers and Pathmakers” brought together 100 women for a morning of panel discussions and reflection about the voices and visions of women for Canada’s next 150 years. Public Policy Forum 30th anniversary: This event, hosted by the Prime Minister, celebrated extraordinary Canadians at home and abroad and their contributions to public policy. REEL Canada: As a Canada 150 project, REEL Canada organized the world’s largest one-day film festival to celebrate National Canadian Film Day on April 19. Through such storytelling, students at Silverthorne Collegiate Institute in Etobicoke viewed Breakaway and reflected on the acceptance of each other. Lieutenant Governor’s Climate Change Essay Challenge: In partnership with the Centre for International Governance Innovation in Waterloo, high school students were invited to imagine a Canada in 2067 in which the human causes of climate change had been successfully reduced. Three forward-thinking young writers were honoured on April 21. Canada By Treaty/Words to Form: On April 27, the University of Toronto launched two exhibitions with powerful messages about responding to the Calls to Action in the Truth and Reconciliation Commission’s report in this sesquicentennial year: one an architectural monument and the other teaching about treaties. Invictus Games volunteer recognition: I hosted a reception on April 25 for the volunteers who are stepping up to support the 2017 Invictus Games to be held in Toronto. These games, established by Prince Harry, are the only international adaptive sporting event for ill, wounded, and injured active-duty and veteran service members. Toronto Symphony Orchestra Canada Mosaic: On April 23, the Toronto Symphony introduced the next fanfare, Sesquie, for Canada’s 150th and hosted a concert featuring Honens Prize recipient Luca Buratto. Syrian refugee welcome: The York Regional Police organized a reception in Stouffville on April 22 to pay tribute to refugees who have settled in the community during the past year and to thank community members for their dedication and compassion. What a heartwarming celebration of Canada in its 150th year! 49th Sinhala and Tamil New Year celebration: A focus of the celebration this year (April 22 in Etobicoke) was on fostering social inclusion in communities and recognizing Canadians as generous, empathetic, and accepting people. L’Ordre de la Pléiade: On April 24, six distinguished Ontarians were recognized for their dedication to enriching Franco-Ontarian culture. Bonham Centre Awards: In Toronto on April 26, the Mark S. Bonham Centre for Sexual Diversity Studies honoured four Indigenous individuals who throughout their remarkable careers have worked to advance understanding of sexual diversity in Ontario. The event was also A recognition of a country striving to be truly inclusive as it celebrates its 150th anniversary of Confederation. This contest, created by the National Centre for Truth and Reconciliation, asked young people to share their hopes and dreams for Canada through story and art. The award ceremony was preceded by inspiring conversations with students from local schools. For 80 years, Experiences Canada has promoted educational exchanges for youth. To celebrate the vibrant and diverse communities that exist in today’s Canada, Glashan Public School in Ottawa demonstrated the value of such experiential learning. A Signature 150 event, this gala inspires achievement and invests in the education of Indigenous people for the long-term benefit of individuals, families, communities, and Canada. How humbling to have been among amazing achievers recognized yesterday by @Indspire and @GGDavidJohnston. Dr. David Cameron of the University of Toronto and research colleagues hosted a breakfast in recognition of the 150th anniversary of the British North America Act, 1867. Up/Rooted: Refugees, Resettlement, Community: At a time of unprecedented rates of displacement of people around the world, the International Migration Research Centre and its partners drew the attention of thoughtful minds to the practice of global citizenship and the challenge of continuing to build and reinforce the kind of cohesive society in which Canadians believe. Tapestry Opera: An evening of powerful music and creative voice shone a light on troubling issues of social justice both past (internment of Japanese-Canadians) and present (human trafficking), seeking to develop awareness and empathy. Canada Recast: First and Next Canadians: The Gardiner Museum hosted a dialogue with the Rt. Hon. Paul Martin and Wab Kinew, moderated by Doug Saunders, on Indigenous perspectives of Canada past, present, and future. International Women’s Day: Mayor Bonnie Crombie of Mississauga hosted a young women’s empowerment breakfast, encouraging participants to think about what bold actions they could take to help shape Canada’s next 150 years—to design a better future for us all. Vimy Foundation Centennial Celebration Dinner: The historical narrative of the Battle of Vimy 100 years ago speaks of how it influenced who we have become as a nation. This event committed all to never forget and to teach the new generation. Organized in Ottawa by Universities Canada, this event brought together university students from across Canada for important and visionary conversations about what kind of Canada we want in the next 50 years. The Lieutenant Governor invited Ontarians to share 150 stories about what it means to be an Ontarian in this country. The resulting book and visual exhibition are inspirational—they tell stories of place and people and give evidence of the characteristics that have come to define us. Tafelmusik explores the century before confederation, linking the beautiful European music of the time with videography, storytelling, and dance reflecting the intersection of Indigenous peoples and settlers. Heritage York dinner: The annual dinner focused on the evolution of the viceregal role and was preceded by the unveiling of a restored portrait of Lord Durham at Lambton House. Lieutenant Governor’s Ontario Heritage Awards: The recipients of these awards, presented annually by the Ontario Heritage Trust, are recognized for their stewardship of the built and natural heritage, and for bringing our past to life. The Crown and Reconciliation: Lakehead University in Thunder Bay sponsored a public talk about the relationship between the Crown bound in kinship through treaties with Indigenous Peoples and the current journey of reconciliation. Black Canadian Trailblazers: Historica Canada hosted an event at Koerner Hall during Black History Month to remind us of the rich and diverse contributions of Black Canadians, past and present. Shame and Prejudice: A Story of Resilience: An exhibition by artist and curator Kent Monkman narrates a story of Canada through the lens of First Nations resilience at the Art Museum of the University of Toronto. EDCO (Economic Developers Council of Ontario): A 60th birthday exploring how to fulfill the promise of this province in the Age of Disruption. Toronto Garrison Officers’ Ball: Celebrating the ball’s 200th anniversary allowed us to express our gratitude for the remarkable breadth of our military’s service at home and abroad as we have matured as a country. Whiskey Jack: Stories and Songs of Stompin’ Tom: A birthday celebration of a Canadian icon. It actually started on New Year’s Eve with the official kick-off of the City of Toronto’s “TO Canada with Love” at Nathan Phillips Square with the iconic TORONTO sign as backdrop and merciful speeches on a cold winter’s night. I welcomed hundreds of people to Queen’s Park for the traditional annual New Year’s Levee. Guests had the opportunity to interact with many Canada 150 Signature Projects. View the complete photo album. ParticipACTION launched its Canada 150 Playlist – 150 physical activities that define us as Canadian. Designed to motivate us all year long, it’s all about wellness. The Toronto Symphony Orchestra launched a yearlong collaboration of more than 40 orchestras and 40 events. This concert paid homage to the legacy and vision of Canadian composers and unveiled the first “Sesquie”. Historica Canada is collecting Here’s My Canada stories. I was proud to contribute. Sheridan College: A 50th anniversary of providing transformative educational opportunity. Pay Equity Act: A 30th anniversary recognizing the contributions of many who work tirelessly to make pay equity a reality. Garden Club of Toronto: A 70th anniversary recognizing the dedication of volunteers in beautifying spaces and building community.